I recently started to collect retro video games, mostly classic 16-bit stuff. One of the issues here, after you have made up your mind about the console systems you want to collect is to decide whether you want to limit the collection to a certain region. Do you only want to collect European PAL games, North-American NTSC games or Japanese games? I made the decision to go all in and collect everything. The main issue here is that it is nearly impossible to buy many Japanese games in Europe. And the ones that are on offer are quite expensive as well. That's why I began to check out sites in Japan directly to order from there instead, and one of the greatest is Yahoo Auctions Japan. This is one of the biggest auction sites in Japan -- eBay is not offering a platform there anymore -- but the problem is that if you are not Japanese, you cannot really register an account. The first issue you will come across is the captcha verification. Since Japanese signs are displayed in it, you need to find a way to enter them. While copying and pasting from other sources works, it is not something that is done quickly unless you have access to a Japanese keyboard and know your way around in the language. But even if you manage that, you may run into other troubles such as having to have a local -- read Japanese -- shipping address or bank account. Last but not least, you will run into communication issues with many sellers on the platform and the fact that most ship only to Japan. The only viable solution for people not living in Japan is to use a proxy service. I have been using Japamart for that but there are others such as From Japan or Jauce and I will switch to another soon as the fees are lower..
You can sign up on these sites directly and how things go from here depends on the site. For Japamart and the majority of others, you have to make a deposit via PayPal or Credit Card payment first. The deposit amount multiplied by two is the maximum amount you can bid on auction on Japamart while it may be handled in a different way on other sites. All services charge a variety of fees that you pay on top of the item's price and shipping to another domestic location in Japan. It usually comes down to paying a commission and maybe other fees such as a bank fee and a transaction fee on top of that. Sometimes, you pay fees to the seller of the auction as well if that is listed in the auction. It pays to compare fees on multiple sites to make sure you are not paying more than you have to. These sites offer English pages and provide you with information about the fees that they charge. FromJapan from 700 Yen 200 yen per deposit 200 yen payment fee at least 900 yen Check extra fees here. Note: 1000 yen are roughly 8.9 Dollar, 7.6 Euro and 6.7 British Pound. As you can see, fees differ a lot between services. Some services let you combine shipping and handling (which comes on top of all that) so that all your goods are sent to you in a single package. Some also let you combine shipping and handling for the domestic transfer, but only if you buy from the same seller on the same day, and if that seller accepts that. You may want to check optional service fees. Some proxy services offer to check the content of packages, or repackage items into sturdier boxes which may be better for overseas shipping. If you don't speak Japanese, use a translation service to translate the auction site. This should give you a rough understanding of what the item is about. Rough because the translation won't be perfect but if you take into account the photos and the translation, it should provide you with enough information. Some sites translate auction sites for you but that is also by using machine translation. Chromium and Google Chrome support automatic translations which makes them excellent for this task. Other browsers may support translation extensions so that you may use them as well for the task. How to order items from Yahoo Auctions Japan if you are not Japanese and cannot create an account on the site for that. This is a very useful and great publication, specially when you do many deals with Japan. But, at this moment, I shall give you one more place you can go to, and it works really well. 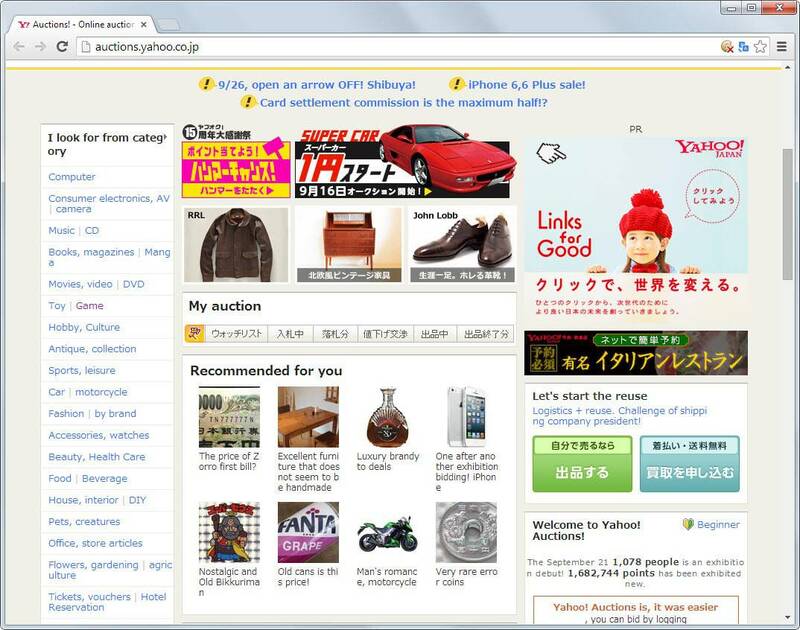 It’s a direct website, from Yahoo, which help people from outside Japan, to buy from Yahoo Japan Auctions. You’ve got only a very small fee to pay, and you must have a paypal account (required). Well, here’s my suggestion to you, all. Warning! By default, Buyee charges you 500Y for “inspecting” the items: immediately remove the check in the form, for my experience are thrown money. I used Buyee for three years and sent me some twenty boxes of various sizes. All well if the vendors in Yahoo.jp are correct, but no assistance and above all no refund from Buyee which, in case of default, stated “please kindly understand that our inspection could only cover the basic appearance check. your case will not be accepted. ” (a seller sent me a different item from what I bought), another case had come to me an empty parcel, and I verify that the item I bought is still in the auction! and have refused the refund because “we can not confirm the contents of the box” (I wonder how you can confirm the contents of an empty package!). Fortunately I had paid with Paypal, and my refund came with me, with the mockable threat of Buyee: “Since it may affect your membership if you open a dispute on PayPal, we kindly ask you not to do so in the future.” Of course, but because I do not buy more from Buyee. Regardless, I bet you need a credit card or some sort of online payment method eh? They accept PayPal or Credit Card, well those that I checked out. Any suggestions on how to do the same for websites in Thailand? Hm, was not able to find a site like those listed below, sorry! I use zenmarket.jp It is the cheapest and best buying service I’ ve ever used. Highly recommend. They charge only 3$ per 1 item. Yes, actually Zenmarket is the cheapest and their service is really good. Please add it to the comparison table. The second in my list is FromJapan. Im using forwading service to get some Japan local address. But the problem is, I cannot pay using cc through their Japan auction service. They wont allow any aboard credit card. Only Japan credit card allowed. Pls help me how to deal with this. I dont have any bank or other facility to pay. I’m living in Tokyo japan and used to export car parts from here to people around the world. I made yahoo auction accounts for customers who buy a lot or buy to re-sell to their own customers. It cuts out a lot of back and forth in communication about how much to bid etc. If anyone is interested in starting a business selling Japanese items in this manner let me know. Hi Den, I really interesting with you for buying japan items this is my email bellow dbmoorew711@gmail.com kindly get back to my email address. hello, Dan my name is Joseph and i am very interested in doing something like this. I am interested Dan, let me know how I can get in touch. Do not use BUYEE under any circumstances! They have proven to be fraudulent, unprofessional providers re: packing/shipping. I had several (20) transactions with them and each very pricey. As packages arrived It became apparent that they forward the original packaging from the Yahoo seller, not at all what I anticipate from a professional buying/shipping service who charges a premium. Packages arrived in fair to excellent condition with NO standard. When I’d purchased an exceptionally expensive item, similar to all toys before, with no added fragility , I received their warning requiring protective over wrap be added to insure safe delivery of my purchase. Unhappily, I opted to receive an intact purchase and paid. The item appeared in the original manufacturers protective box, over wrapped by the manufacturer of the toy, never opened and in the manufacturers original shipping box. BUYEE EXTORTED a premium on top of their standard rate to forward the exact package and packaging which they received from my Yahoo JP seller! They refuse to refund my added cost with their reply being-“ask for pictures next time “! Who finds this acceptable? I thought they boxed and shipped received items, to the standard you pay for. Not them . AND BUYEE DOES NOT RESPOND TO VALID CUSTOMER COMPLAINTS ! Responding to my extortion by offering optional pictures next time is a slap in the face! STAY AWAY FROM BUYEE! Why it is not in your comparison table yet? Reasonable service fee, no bank fees, multiple shipping options, shipping discounts, credit cards or PayPal payments. This is a very informative blog. I’m glad I found it. It shares very useful information. I’d advice anyone planning to buy in Japan to read it carefully. I just finished reading the terms of service at the Buyee site. business purposes (they state so explicitly). not to be what was described, or they are simply out of stock or damaged. I suppose this is fairly standard practice, even at Ebay, Amazon or Yahoo, probably. how and when a customer can appeal, lodge a complaint or refuse specific costs. (http://buyee.jp/help/common/terms) and think twice before accepting their terms. Personally I don’t think I will make use of their services. Hi, I’ve been using Buyee for about 6 months and had items sent to the USA and for the most part haven’t had many problems. The package storage and consolidation service is really good. 30 days in the warehouse without extra fees! I’ve probably bought over $10,000 in items from them… only a couple of complaints. The customer support is responsive though you can only contact them by email. I’ve had a 4 items arrive with something broken. In 3 cases I had paid the 500 yen for the insurance. After investigating and me sending clear photos of the damage with notes I was fully refunded all their fees and the item cost in 2 of the cases. In the 1 case I didn’t buy additional insurance and package inspection they didn’t do anything. In another case it was not possible to see the item “undamaged” in the yahoo auction photo so they didn’t refund me. That’s my only bad case out of the 50+ items I’ve bought from them. I’ve also used FromJapan but for much fewer purchases. So far no problems with them but I find the auction interface to not be as smooth as buyee’s sometimes you miss an item because of it. Also you have to deposit funds first in order to make a bid. With buyee you do not. You only pay after you win. From what I have seen, Buyee needs you to pre-authorize them to access your PayPal account, or to use your credit card to add funds to your account BEFORE you’ve even won an auction item. I certainly don’t feel secure with either option. Will PayPal refund me if I do not receive an item that is ordered through a Buyee auction? Why does it have to be so complicated? Buyee gives you tracking number for every packages, so you can follow up as if the package delivered safe ad sound to your house or not. Im living in japan for 24 years and decided to help users interested in buy on yahoo auction. What I will do is, help you to buy, reading or asking the seller for any info you want, and if you buy a lot to resell , we can discuss in making one account for you use by yourself redirecting your stuff to me, to be shipped later for you. Please search for Edson Sassaki. Edson cannot seem to reply to the e-mail address you have given can you please give me the full e-mail address. be one of the easiest to use, and their service to be quite fast and friendly. They even offer to ask questions to Yahoo sellers for you if needed! So far i’ve only had good experiences with them! has been working out well for me! Hi, how do i know if an auction is already close? thanks. I work for a similar proxy site, and would appreciate getting our own details added to this post – what’s the best way to contact you about it? HOW TO SELL AN ITEM FROM the USA ON YAHOO JAPAN AUCTIONS? Can anyone suggest a good and reliable proxy service for me to use? Preferably I can receive the money using paypal. Anyone with any experience? Thanks! Any way you can walk me through this? Thanks in advance. Does yahoo japan ship worldwide? You can use Sendico.com, they can ship parcel at a very reasonable cost. Actually, I use buyinjapan.jp, maybe the design is not so great but service fee is only 200 yen and it works well. I know this is an old blog post but with some responses only a few months old figured I’d post. Husband runs “No Country for Tall Men Exports” on facebook and along with bidding on yaj purchases from basically any online or physical store he can reasonably get to. Check him out. 15% commission and you are dealing with a real person that is not blocked by many auction sellers when they realize they are dealing with a company whose message responses are very robotic. Hi, I’m from Peru, I have problems with FROM Japan, because when I made the auctions that I won, it does not read my Paypal account and it comes out as an error “TP-1810272218424061A-NWHQI4VH: E300: Failed request to PayPal DoExpressCheckout API. [10001 ] “. They have even blocked me from the auctions. I have enough background, but I do not know what happened.